I just had to take this picture. I saw it at a filling station on my way to our holiday destination. 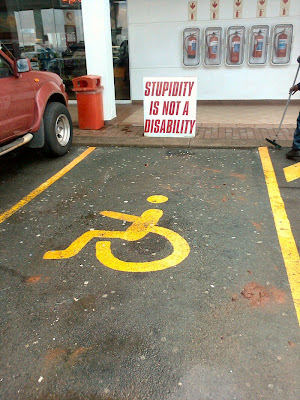 At many highway stops there are designated parkings for disabled drivers or passengers, but most of these spots are marked by the architect and the actual garage owners or managers just couldn't give a damn if brain-dead drivers park there instead. Way cool. I myself is in a wheelchair,and believe me it is utterly frustrating to see that parking space occupied. These parking spaces are made wider that a normal parking space to incorporate the size of the wheelchair next to the car. Unfortunately not everyone understands that,and as what happen with me a few years back is someone pulled in alongside me on a disabled parking. Upon coming back i could barely fit my wheelchair between my Car and his. Needless to say his car got some serious scratch marks i think he deserved. Mmm... They complain about jobs in this country. Let a few of them watch carparks, with permission from the carpark owners. They could clamp wheels and have an income. Ah, a filling station. This photo has been bouncing around the interwebs for a while and the thing that stands out the most is not the sign but the flock of fire extinguishers. I guess filling station explains it. I wish all HC spots were wider... alot of them in Canada are the same size as a regular spot and just closer to the door. Which is difficult for me since I walk with a cane and need my door to open wider to get out. And yes, I see too many idiots parking in these spots without the placard.